Meet Jonny: teacher, father and football fan. 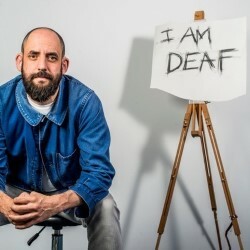 He's an artist, campaigner, and deaf. He wishes he could sing and loves to dance, but he can't hear the music unless the bass is loud. Jonny grew up in a hearing family, surrounded by fear of the stigma of disability. This one-man show tells Jonny's moving, funny story of disconnection, difference and desperation to belong and is a starkly honest portrayal of a man seemingly confident, outgoing and popular, who is inwardly vulnerable and, at times, isolated. In a hearing world Jonny is different. British Council Showcase.